Samsung officially announced the much rumored, much speculated about, and much leaked Galaxy Note 4 today. In spite of the leaks, there were a few surprises. First, though, let’s get out the way what isn’t there, and what rumors are not true. The phone doesn’t have a radical new design with extra small bezels. The Note 4 is almost exactly the same size as the Note 3, but the hardware is upgraded in almost every possible way. Better display, better cpu, better construction. In spite of the faster processor and higher density display, Samsung claims 7.5% lower power usage and better battery life than the Note 3. The new display is a scaled down version of the one on the Galaxy Tab S tablets, which have been widely acknowledged to have the best screens in the business. The Note 4 packs an incredible 3.8 million pixels in a 5.7 ” screen, for a whopping 550 pixels per inch (PPI). The screen is capable of displaying 90% of the Adobe RGB color space, something only expensive desktop monitors have been able to do before, and significantly better than current mobile LCD screens. The front camera offers a 90 degree wide angle lens so you can get more people in your “wefie” (a group selfie), and if that’s not wide enough it offers a panorama mode that lets you pan the phone from side to side, capturing a view as wide as you need it. And the heart-rate sensor on the rear of the camera can be used as shutter button, all but eliminating camera shake. While the visual improvements are getting most of the press, the Note 4 offers improved audio capabilities, too. While it still has only one speaker, located on the back, it now features 3 microphones for improved background noise suppression during both phone calls and audio recording. In other miscellaneous improvements, Samsung is claiming the glass is harder and more break resistant than its previous devices. The phablet also offers a quick charge mode that can take the battery from zero to 50% charge in only half an hour (twice as fast as the Note 3), and the ultra-power saving mode from the Galaxy S5. While the hardware improvements are getting most of the attention, the Note 4 also offers significant improvements in both features and software. The S-Pen is said to be more refined, offering better pressure sensitivity and a much more pen-like feel. The S-Pen software offers two new writing modes, including calligraphy and fountain pen simulation. On the software side, the S-Pen software now allows you to select multiple items (e.g., images and blocks of text) and save and share them as a single grouped item. You can now use the S-Pen like a mouse, clicking and dragging to select text, multiple images or files, similar to the way you use a mouse on a computer. We at Samsung Update have always felt text selection is poorly implemented and cumbersome on Android, and this promises to be a big improvement. Samsung has further refined Touchwiz, continuing the streamlining and simplification that began with the S5. It has a much lighter, less intrusive, feel, and incorporates some elements that are very similar to what Google will include in Android “L.” One novel addition is the ability to display transparent widgets, letting your background shine through. Samsung has also partnered with Yahoo to make thousands of high-resolution wallpaper images available to Note users. Multi-window has been simplified to make it more intuitive to use, and has been incorporated into the recent apps (multitasking) screen. The new S-Note app now incorporates speech recognition and speech-to-text. A new app, SnapNote, lets you take photos of text or drawings, such as a whiteboard, convert it to text, and continue to update it on the phone’s screen. The app will automatically correct for the distortion you get when you take the picture at an angle, rather than parallel to the source. Earlier, we mentioned the Note 4 has 3 microphones. Samsung says the device has the ability to record and isolate sounds from up to 8 distinct directions, and play back the sound from each of those directions separately. If you record a meeting, you’ll now be able to figure out who said what! Finally, Samsung announced new accessories, and a new partnership with pen maker Mont Blanc. 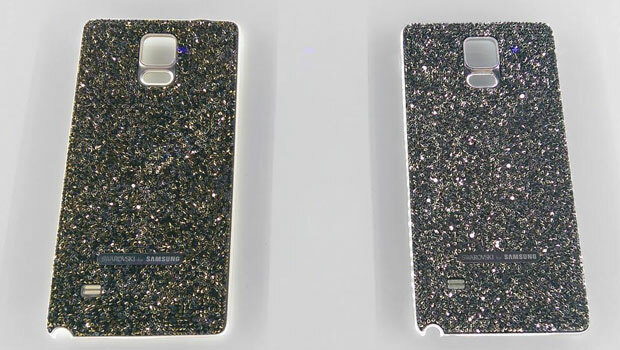 New covers include a windowed flip case, similar to the S-View flip cover for the S5, and a dot-matrix style cover similar to the one available for the LG G3. And, for those who truly like bling, one that’s studded in Swarovski crystals. A bit gaudy for our taste, but to each his own. Mont Blanc is offering two luxury S-Pens, one in the traditional Mont Blanc style, one more contemporary. Each allows you to choose from 6 virtual “fountain pen nibs,” from narrow to wide, so you can write in style. 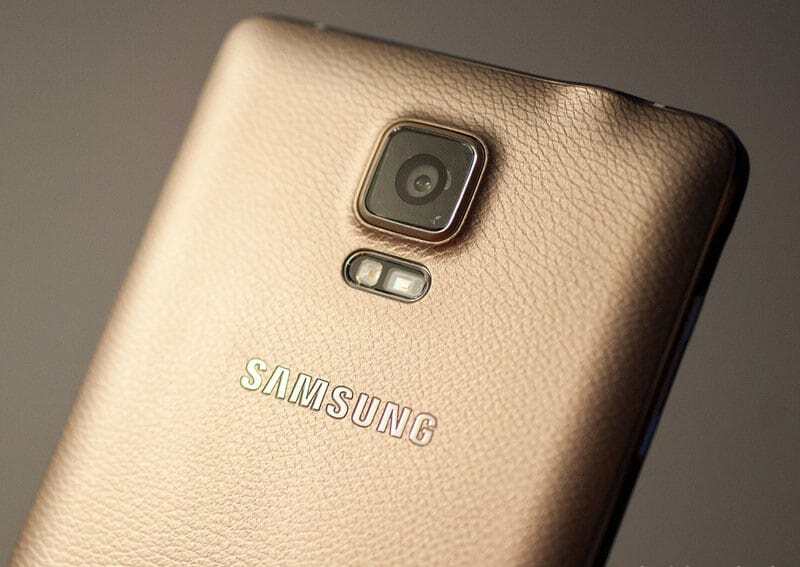 The company is also offering a high quality, soft leather cover for the Note 4. No official word on price yet, for the device or the accessories, but we expect pricing to be about the same as the introductory price for the Note 3. the Note 4 will be available in October for multiple carriers.